Below is a translation of the section where Guskin is quoted. Ever since Donald Trump became US President, the eleven million paperless people have been living in greater fear than ever before. A lot is at stake, especially for undocumented youths like Cecilia. ...Many [undocumented immigrants] have had bad experiences with going public, says Jane Guskin. She researches global migration at the City University of New York, has been active in the asylum rights movement since the 1980s, and is co-author of the book The Politics of Immigration, which is considered a standard leftist reference book on US immigration policy. She suggests meeting in a Bengali restaurant in Queens, the urban district with the highest foreign-born population density in the country. "When Daca was introduced, there was great skepticism in the community," says Guskin. "To qualify, you had to tell the state where you live and work, where you go to school." Many were afraid that this information could be used against them. "It turns out they were right," says Guskin grimly. "Some people go to the immigration office for their annual appointment and are picked up and deported by the ICE agency!" American media are full of reports of the consequences of this uncertainty: Mexican citizens storm the consulates to renew their passports so they can quickly leave the US in an emergency. The head of a large New York hospital reported at a press conference that migrants were shunning health care institutions. Instead, they would place injured or sick relatives in front of the emergency room door and run away. And because the hurdles are high, the number of new applications for Daca has fallen sharply. "It costs $ 500 to apply. How can you pay for it if you have to work off the books?" Guskin asks. In addition, the forms are so complex that only lawyers can fill them out. Anyway, Daca is just a poor compromise, says the longtime activist Guskin. There is no path to naturalization. No one is really willing to improve the legal situation of migrants. For decades the Republicans have been presenting themselves as protectors of an idealized America "from the foreign hordes," but in practice they have shown increasing interest in allowing a steady influx of cheap labor -- "completely disenfranchised, of course," says Guskin. "No one sets up a union or demands a minimum wage if the boss can threaten to call the immigration police." This deception of the xenophobic Republican base was one of the reasons for Trump's electoral success. The Democrats, on the other hand, like to see themselves as defenders of minorities. But in reality, hardly any concrete action followed the inclusive rhetoric. At most there might be some little goodies before elections, if Democrats wanted to secure the votes of Latinos and Latinas. This is one of the reasons why many young migrants feel that the concept of "Dreamers" has become politically exploited. In the last elections less Latinas and Latinos voted for Hillary Clinton than expected. It’s clear that immigration issues will continue to occupy much of the political discourse next year, and so will misinformation. A lot will depend on how effectively people at the grassroots work to counter the myths and distortions. This fall we participated in five dialogues on immigration in the New York City area. We’re hoping to do more next year; please contact us at thepoliticsofimmigration@gmail.com if you’re interested in sponsoring an event. But we don’t want to be the only ones: we’d like to see as many people as possible holding their own dialogues. You can watch a full dialogue, sponsored by the multi-ethnic human rights organization Families For Freedom in New York on November 29 (the orientation is corrected after the first six and a half minutes). But remember: no two dialogues are the same. The participants on November 29 were mostly immigrants or sympathizers; other dialogues include people with opposing views, which we need take seriously and address with respect. There are many other educational resources. One is a series of email “lessons” offered by the Pew Research Center this fall. These deal with basic facts about immigration: the actual number of immigrants, how many have legal status and how many don’t, the longterm demographic effects, and how opinions on immigration have shifted over the years. People might be surprised to learn how often the facts run counter to the general impressions people have. Go here to have the emails sent to you. So what do we need a wall for? To keep them from leaving? Interestingly, the Pew course is already a little out of date. 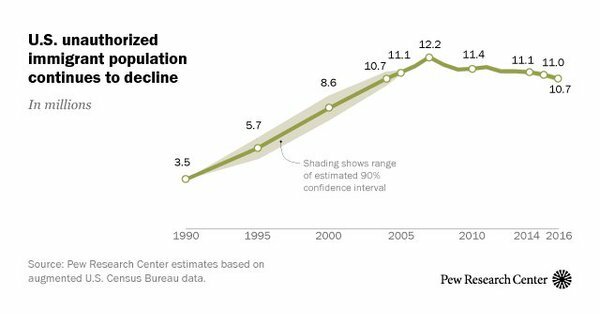 While the media continue to talk about the “influx” of undocumented immigrants, Pew’s latest study of the undocumented population indicates that it has continued to fall—from an estimated high of 12.2 million in 2007 to some 10.7 million in 2016. Finally, for last-minute shoppers: Do you need a present for someone who has questions about immigration policy? There’s still time to order The Politics of Immigration: Questions and Answers here, or else from your favorite bookseller. Update, 12/19/18: Pew Research has now revised its email course to reflect the new data on the undocumented population. December 18th: Drop the Charges! 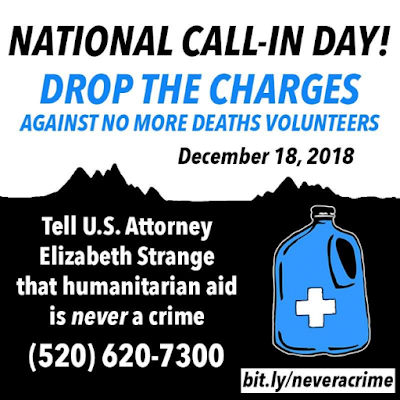 On December 18th, International Migrants Day, join us in calling on the US Attorney's Office to drop all charges against No More Deaths volunteers. Nine volunteers are currently facing federal charges and lengthy jail sentences for their work providing humanitarian aid in the borderlands. Elizabeth Strange has the power to drop the charges and cease these prosecutions immediately. Join us in demanding an end to federal harassment and prosecution of aid workers. On November 29 Families For Freedom sponsored a participatory dialogue on deportation and immigration detention with the co-authors of The Politics of Immigration. The event was live-streamed and can be viewed on the Families For Freedom Facebook page. Many thanks to Families For Freedom for giving us the opportunity to be part of this intense discussion. With the present intense focus on immigration, it’s more important than ever for people to share their views and experiences. We look forward to facilitating more dialogues like this one next years, and we encourage other people and groups to schedule their own discussions. Not all dialogues are the same. 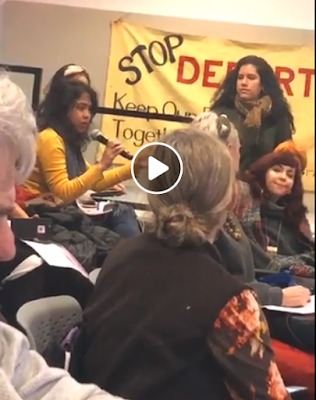 The November 29 group included a number of people who were able to talk about their personal experiences with detention and deportation. Other dialogues have involved people who expressed very different views on immigration. For us the goal is to get these various ideas out in the open so that people can check them against their own experiences and those that others have had. Note: the view is vertical at the beginning, but it’s corrected after a few minutes.